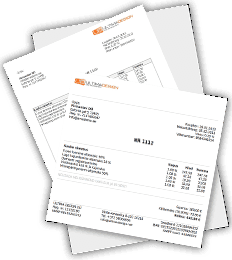 Inv24 was created in 2008 as a completely free invoicing programme for a small European company. At the same time, we decided to make it an open project so that anyone could use it without charge. Since Inv24 quickly became popular with small companies, we started receiving multiple suggestions on how to improve the software, and we decided to charge a small fee for using additional options, while leaving all the old free features and supplementing them with some totally complimentary bonuses. All money received from selling the additional paid services is used to develop this project in order to make invoicing still more convenient! Inv24 is targeted primarily at small business, the owners of which prefer to keep accounts themselves. The number of registered users currently amounts to more than 16 000 – these are the owners of small enterprises from Europe, the USA, Australia, Asia and South America. Our top priorities are ease of use, convenience, safety and confidentiality; therefore, we exert all efforts to make invoicing even more comfortable. We see safety and confidentiality as secure storing of your data without taking any additional action with it or transferring it to third parties. You can be sure that all your data is kept in a reliable place and is well protected by the European legislation.